Base note, oriental warm adds body and richness, incense like. Sweet. a bit wood and balsam like used in chypre perfumes. Nice additive to gourmand. I've tried a number of amber accords from other vendors, and this is the best one I've encountered. Not dry or flat or weak. Just perfect. I meant to add this part to my previous review (still under Anonymous). I applied some of the Amber to my skin and it turned into a smoky incense type scent that is very characteristic of Peru Balsam. Having said that, I believe there may be some Peru Balsam in this Amber, but it is not readily detectable until application. 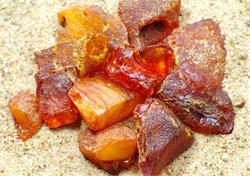 In fact, this Amber doesn't smell like it's only a classic accord of labdanum, benzoin, and vanilla. There seems to be something else in it that makes it deeper, slightly more animalic, and more "oriental" than those 3 notes would suggest. To the staff at CreatingPerfume, I would really like to know what notes are in it if possible. In any case, to me this is a superior Amber. No other Amber will do. As the other reviewers below me said, this is THE amber. This is the exact amber I remember when I first smelled it. All the other ambers I tried were either to weak, too heady with the sweetness from the vanilla aspect, but this is the only one that's just right, and I'm glad that I found it here. This Amber is beautiful. I’d just about given up on the fantasy of including amber in compositions or even knowing what amber is supposed to smell like. This is it. Better than Givaudan’s Ambermax even. This is the only Amber you'll ever need. Wow! This is THE amber that I didn't realize I was searching for until I sampled it. Very rich, sophisticated, faintly sweet and powdery. This is absolutely the perfect solution to a very specific note I've been attempting to achieve in a blend I'm working on. Thank you!